Hans Zimmer’s latest score for Christopher Nolan is a planet hanging in space, rotating with variable speeds; it’s a weightless confluence of cosmic expansion and humanity’s small but significant purpose in the vast empty bubble of the universe; an ambience of shifting tonality seeking correlation; a physics experiment in spacial velocity, forward motion, indefinable stillness, and rotating volume. More importantly it’s a human heart radiating connection, far-flung human DNA reaching out to the stars from whence it came. It’s a truly breathtaking work – literally, as much of its effect is through the breath of the massive and magnificent pipe organ of London’s Temple Church and its virtuosic organist, Roger Sayer, which adds so much to the expressiveness of the score. In the music for INTERSTELLAR, Zimmer has accreted a vast, growing, impressionistic holographic musical work painted not in melodies or motifs but in feelings – in the amassing exospheres and minimalist tonal environments that advance, rotate, reflect, and pull upon one another. The score is in fact quite removed from its traditional duty of accompanying specific actions of characters and story; instead, the music focuses on the underlying themes and subtexts of Nolan’s film (Zimmer began writing two years ago, basing his initial musical impressions on a note Nolan had given him detailing those underlying themes that would be inherent, if implicit, within the film he would be making. The composer had a day to turn in his immediate impressions to Nolan, without ever knowing what the film was going to be about; the full score then grew out of those original notions). The music, then, seems to be as aloof as the cosmos, wafting in the spaces between the worlds, coloring those dark, icy distances, yet just a moment later it is rushing like lava to cascade into the listener’s ears with feelings as personal and intimate as the bond between father and child. 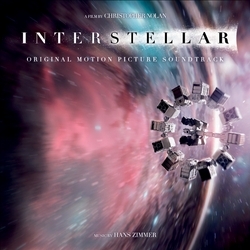 So as the film’s characters travel through a wormhole in space to seek a potentially habitable planet elsewhere in the universe, Zimmer creates a poetic resonance that eloquently exposes the headspace of the main character as he heads off into space to save humanity, at the cost of leaving his daughter forever behind – because the score is not in fact reflecting the clustered and distant cosmic bodies that occupy the spaces of outer space, it is expressing a much more personal and very human notion. The music serves as the emotional tissue that links the absent family; a tone poem for conflict, duty, passion, and the unknown spaces that lay waiting. The sense of sacrifice in facing the choice of savi11ffset by incursions of onrushing textures that ramp up their volume to become nearly overpowering; repetitive musical figures that cycle beneath reverberant drones to build up an claustrophobic sense of inexorable tension, reflection, and desultory introspection. Zimmer’s traditional percussion-heavy style is virtually absent in this score, displaced by wafting strata of serene tonality, gravitating between various elements of underscore and counterpoint. His primary instruments here are strings, piano, flutes, a very subdued choir, and that incredulous pipe organ (which Zimmer describes as “a huge, complicated synthesizer”), all of which give the score an intriguing and renewed sonic sensibility, as well as a buoyant, spacious and organic quality that suits the feeling and the substance of the film. INTERSTELLAR is a massive, masterful work, and continued evidence that Hans Zimmer still has new ways to surprise audiences and directors alike with his capacity for grafting intense musical semblances onto amazing works of cinema. The regular album concludes with 15 tracks; the deluxe edition offers an additional eight tracks, totaling 23; and an “Illuminated Star Projection Edition” in special light projecting package consisting of 28 tracks as yet forthcoming (see watertower-music.com). Originally appeared in my Soundtrax column for Dec 5 2014.